Canada’s mandatory long-gun Registry has been a billion-dollar failure that has not reduced crime. In recent months, concerted efforts have been made to scrap the Registry. Success was almost achieved last week, when a Private Members Bill to eliminate the Registry was narrowly defeated by just two votes. On September 22, Members of Parliament voted 153 to 151 to maintain the Registry. The vote followed weeks of intense political maneuvering by the federal Conservative, Liberal and NDP parties. The Canadian Outdoors Network (CON), a consortium of 28 outdoors groups (including the Canadian Shooting Sports Assn. ), says Parliament’s decision to keep the long gun Registry will not end the national debate on firearm ownership. The Canadian Outdoors Network, representing 500,000 Canadian hunters, shooters, and sportsmen, will continue its campaign to scrap a program plagued by cost overruns and controversy. Since 1995, the registry has cost taxpayers more than $1 billion with no demonstrated reduction in gun crime. Canadian Sporting Arms & Ammunition Assn. Newfoundland & Labrador Wildlife Fed. Share the post "Canada’s Long-Gun Registry Survives by Two Votes — Canadian Sportsmen Vow to Fight On"
Swarovski makes fantastic hunting scopes. They feature extremely high-quality glass, that is bright and razor-sharp. Excellent light transmission ensures good performance at dawn and dusk. Right now, through the end of October, MidwayUSA has clearance-sale pricing on two Swarovski medium-range zooms suitable for varminting or long-range hunting. The Swarovski PH 4-16x50mm (30mm) with Ballistic Reticle (item #676135) is marked down from $1,849.00 to $1,399.00, a $450.00 savings. The higher power Swarovski AV 6-18x50mm with Ballistic Reticle and 1″ main tube (item #220145) is $929.00 on sale, reduced from $1229.00. Whenever you can get a mid-range zoom Swaro for under a grand, it’s a pretty good deal. Both these scopes feature diopter-type eyepieces offering ample focus correction. That’s a big plus if you normally need glasses but don’t have prescription shooting glasses. Both scopes are covered by Swarovski’s 30-year warranty. The AV 6-18x50mm is less expensive, but the PH model should provide enhanced lowlight performance. IMPORTANT: both these scopes have metric, non-standard click-values. The PH 4-16x50mm moves 0.5 cm per click at 100 meters (about .18″ at 100 yards), while the AV 6-18x50mm moves 1.0 cm at 100 meters (about .36″ per click at 100 yards). Make sure you can live with metric clicks before purchasing either scope. Share the post "Good Deal on Swarovski Variable Hunting Scopes"
Next week’s event is sold out, but the NRA will offer other range development conferences in the months ahead. NRA event coordinator Kara Schlifke reports the 2011 dates will be posted as soon as possible. Potential participants should register early to guarantee their spots. Registration is $450.00 per person, and includes a continental breakfast, afternoon snack, and conference materials. Would you like to learn more about this program? Contact Kara Schlifke at KSchlifke@nrahq.org or 877-NRA-RANGE, or visit the NRA’s Range Development webpage. 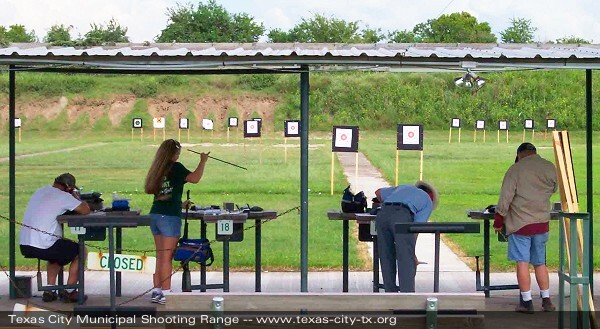 Share the post "San Antonio Hosts Gun Range Operations Conference Oct. 9-13"